Navy quarterback Kaipo-Noa Kaheaku-Enhada pitched the ball on an option. 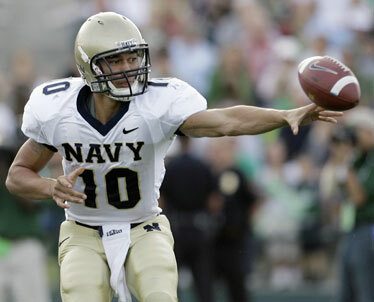 DENTON, Texas » Navy is no stranger to high-scoring shootouts. The Midshipmen have an NCAA record, and a bowl-berth-clinching victory, to show for their latest one. The Midshipmen and North Texas scored a major-college record 136 points in Navy's 74-62 victory yesterday. "There wasn't a whole lot of defense being played on either side. Look at them -- they scored 62 and they lost," said Navy coach Paul Johnson, a former Hawaii offensive coordinator. "If we don't score every time we get the ball, we're in a deep hole." Navy, the nation's best rushing offense, set a school record by running for 572 yards with eight rushing TDs a week after snapping a 43-year losing streak to Notre Dame. Zerbin Singleton ran for three TDs, with a 3-yard run just before halftime and a 65-yarder midway through the third quarter that pushed Navy ahead 58-49. The long run was the fourth straight touchdown for the Midshipmen (6-4), a stretch that put them ahead for the first time. The Midshipmen tied a school record by scoring at least 30 points for the eighth straight game. That stretch includes victories of 46-43, 48-45 and 46-44, with a 59-52 loss. They scored their most points in a game since beating Colby 121-0 in 1919. Still, this wasn't even the highest scoring game of the season. Weber State and Portland State racked up 141 for the all-division record two weeks ago. Weber State won 73-68 in a Football Championship Subdivision (formerly I-AA) game. The previous record for college football's top tier of competition was 133 points in San Jose State's 70-63 win over Rice on Oct. 2, 2004. Boise State beat Nevada 69-67 this year, totaling 136 points, but that Oct. 14 game went to four overtimes. The teams were tied at 44 after regulation. Rice also had the highest score by a losing team in that game, a distinction the Mean Green (1-8) missed out on by a single point. Singleton's 65-yard score was set up after Ram Vela intercepted a pass by Giovanni Vizza, who was 40-for-50 for 478 yards and an NCAA freshman-record eight touchdown passes. Navy's sixth victory guaranteed it a spot in the Poinsettia Bowl in San Diego on Dec. 20. It will be the Midshipmen's fifth straight bowl game. They will play a Mountain West Conference team in their third bowl game in San Diego. The teams combined for 94 first-half points, including 63 in the second quarter, both major college scoring records. The previous record for points in a half of a major college game was 76, set by Houston and Tulsa in 1968. The old mark for a quarter was 61, by San Jose State and Hawaii in the fourth quarter of a November 1999 game Hawaii won 62-41. Navy starting quarterback Kaipo-Noa Kaheaku-Enhada, a Kapolei graduate, threw for 108 yards and a touchdown, and rushed for 53 yards before leaving with a bruised right knee early in the third quarter.